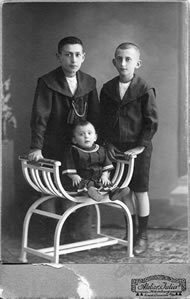 The three brothers; John, Max and Walter in 1914. The picture was taken a few days before the outbreak of World War I. It all started when the author Torkel S Wächter found some battered cardboard boxes in the attic of his parents' home in Stockholm. That was over ten years ago. At the bottom of one of the boxes were some yellowed postcards, written in old German handwriting and impossible to decipher. As it turned out, the postcards were written by Wächter’s paternal grandparents and sent from Hamburg to his father in Sweden during World War II. 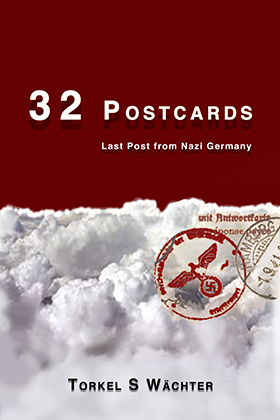 32 Postcards - Last Post From Nazi Germany was published in March 2014. 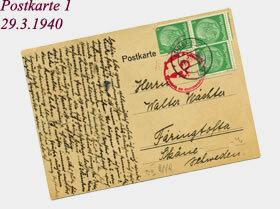 On this website the 32 postcards were published between March 29th 2010 and December 6th 2011. This was done in ”simulated real time” - the postcards were uploaded to the server on the day they were written but seventy years later.